I anticipate the introduction of new gadgets. I keep an eye on tech news and peruse buzz-generating Kickstarter and GoFundMe campaigns. I even occasionally bite on investing in something still in the production stages. 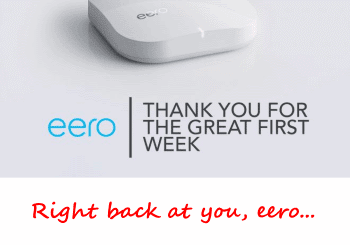 In February, 2015, I bought into eero. eero's product creates a consumer-level mesh WiFi network. Instead of one wireless router you have multiple wireless access points working together. This may not sound new and it isn't -- "mesh" has been in the enterprise for many years. The home consumer, however, has largely been relegated to using wireless repeaters or independent access points (different SSIDs) to expand home WiFi coverage. Mesh is seamless WiFi (one SSID) without the performance loss of repeaters. In mid-February, 2016, eero began shipping the first units to its early-adopter customers (me). Because the eero system is not exactly cheap at $200 per unit or $500 for a bundle of three units, I'm documenting my eero experience for the benefit of anyone contemplating an eero mesh network. NOTE: "WiFi mesh" versus "WiFi range extenders"
A WiFi "mesh" is not the same as a WiFi router plus a wireless range extender (repeater). Although mesh-capable hardware *can* function as a base + wireless range extender(s), the true power of "mesh" happens when every mesh access point is connected via wire instead of rebroadcasting wireless signals (results in 50%+ loss of throughput in single-radio WiFi extenders). A wireless range extender does provide more wireless coverage but it does not make or match the performance of a "mesh". Before diving into the highs and lows experienced with my first-of-three eero units, let's establish what the eero was replacing. If you have no interest in my eero origin story then skip on down to "Plugging in eero #1" for some handy setup information or "eero #1 results" if you are particularly impatient (I won't judge). Several years ago my home network hummed along through a Cisco Linksys E2000 dual-band router. Prior to that I'd had my turn at a good variety of uber-cheap routers but our video streaming needs demanded more. The E2000 fit the bill and was a fine performer... until the internal radio died just out of warranty. That was April of 2013. I was hesitant to just blindly go with another Linksys so, as a stop-gap replacement, I picked up a D-Link 1000 "Media Router" on clearance for a mere $20 shipped. The D-Link 1000 boasted a wealth of router administration options as well as the four gigabit LAN ports I needed to replace those on the old E2000. The D-Link was... ok. The management options were as expected but wireless throughput was sub-par. Our streaming was primarily to wired systems so I let the D-Link stay (hey, only $20, right?) 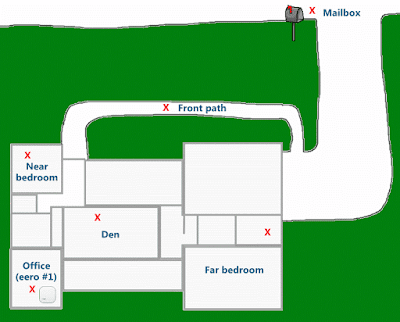 My wife complained of poor connectivity on the opposite end of the house but then what do you expect on the opposite end of the house? It was just good enough for our needs. In early 2015 an article caught my eye: there was a new product in the making for consumer wireless mesh. I was already familiar with a mesh network topology -- the Dell campuses and factories in Austin were blanketed in mesh when I was still an engineer there. In the early 2000's I marveled at how seamless Dell's WiFi mesh network was between the various access points as I ran to meetings checking my email and calendar on a WiFi-connected Dell Axim (remember those?) I had wanted the same for my house but mesh was far too expensive for what would have amounted to a two-node system. Now, in 2015, I finally had the promise of an enterprise WiFi solution at a consumer price point. After a bit more reading I determined that the eero team was more than just one or two dudes in a garage (though that didn't hurt Apple). The team even included former Nest people and I loved my Nest. I was "in" and plunked down my money for the yet-to-be-released eero. And I waited. And then waited some more. Then more. eero was delayed several times from it's original goal of "Summer, 2015". Skip ahead and -- finally -- eero made good on the original promise and began shipping units to the faithful early adopters in February, 2016. You can order eero as individual units or in sets of three. I should note that the rest of the networking industry was not idle in 2015. Several other upstarts have trotted out new home wireless routers including some involving mesh network solutions. eero had an early lead on "consumer mesh" buzz but eero is not the only player in this space. After waiting a full year to get them, my set of eero units sat idle in their packaging for four days while I took care of life. Last night I finally had time and opportunity to dive into setting up my new network toys. The eero packaging is top-notch. I want to keep the retail box (made of cardboard) and use it for something else -- it's that nice. Inside the box of three eeros are three eeros, three power adapters, one Ethernet cable and three small placards designating unit #1, #2 and #3. Unit #1 has a small sticker on it labeled "Start" and it's placard instructs you to download the eero management app. That's it. No user manual or quick start guide. No separate poly bag full of antennas to attach. Just plug in power and attach cable to eero and modem. It was almost too simple for a gadget geek. One Ethernet port for cable modem and one for LAN (to a switch or direct to a PC). The USB port has no consumer use -- it is only for maintenance / service. eero setup / management is accomplished via a mobile device app. This is different than most home routers that require connection to a PC and use of a web browser to access an on-board web interface. The eero app initially connects to your new unit via Bluetooth LE. Got that? Your mobile device must support BLE (a.k.a. Bluetooth Smart) which is a newer, lower-power Bluetooth option. It's expected that more than 90% of smartphones will support BLE... by 2018. Here in 2016, however, I found that only some of my 10 (!) mobile devices sport BLE capability. Fortunately you only need one Android or iOS device with BLE to set up your eero. The erro app may report a setup issue even if there isn't one.The final setup step on my system consistently results in an "eero cannot connect to cloud" error message and a prompt to contact eero support. I cleared my eero's configuration, dropped the eero and network setup from my eero app configuration, power-cycled both eero and cable modem, changed cables and repeated the setup steps several times with the same error result. It was finally time to call eero support. I enjoyed hold music for 40 minutes and eventually spoke with "Steve" who was very nice. He took my information, looked up my system configuration and verified my eero was online and working (huh?) I checked again and it was working... sometime during that 40 minute phone wait my eero decided it was happy and the eero unit #1 icon turned from red to green inside the eero management app. I thanked Steve verbally for his assistance and thanked him silently for not openly implying "user error" when verifying all was well with my eero. Just as a test, I tried power-cycling the eero again and noted that, even after proper setup / configuration, it took a few minutes longer than I would have expected for the eero to fully reconnect. Takeaway: Have patience. If the final step of the setup process says there is a problem it doesn't mean there is definitely a problem. Give eero a solid 10+ minutes to acclimate when setting up a new unit. So with the first (base unit) of my three new eero's now in place, how does it compare to the D-Link 1000 "Media Router" it replaced? To summarize: the eero is great. I tested WiFi throughput for the D-Link and the eero from six points around my house including my front pathway and even way out by my mailbox. Note that, besides Upload and Download throughput rates I also measured Latency and Packet Loss but there were no significant differences to report. To be fair, the D-Link 1000 has been noted for having less-than-stellar WiFi performance. At the time it was released the $150 D-Link 1000 performed more on par with wireless routers selling for half as much. In practice my D-Link's WiFi performance supported three non-HD video streams at a time which has been fine since our TVs (the items with HD video needs) are connected via wired LAN, not WiFi. What will Day Two and the introduction of mesh coverage bring? I'll add eero #2 to the home network and (giddily) run the throughput tests again to see if the mesh can possibly improve upon what is already a marked upgrade in my home's WiFi coverage and performance. Finally I'll wrap it all up with a "Day Three" post to share the results of adding eero #3. That will complete the planned network mesh and quite possibly require my family to begin wearing tin-foil hats to combat the three eeros' shear radio signal strength.